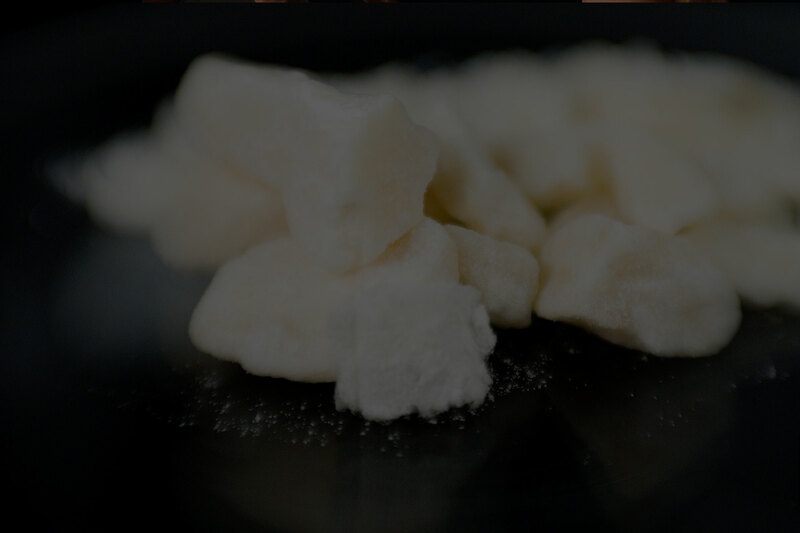 Infamous for its destruction of Harlem and other impoverished urban neighborhoods, Crack is the street name for a chemical known as cocaine hydrochloride, one of the most addictive substances known to man. It’s essentially cooked cocaine with ammonia or sodium bicarbonate (baking soda) added to create rocks, chunks, or chips which are smoked in a pipe. The effects of smoking crack are a short 15-20 minute joy ride and then one of the hardest and most unpleasant crashes in the drug world. Crack is one of the most addictive substances known to man. Crack is popular as a street drug mainly because it’s cheap. However, the high chances of overdose and poisoning make it incredibly dangerous. Coma, convulsions, and even death can result from large quantities or extended use of crack. With a short but exhilarating high and then the devastating crash that follows, Crack creates a vicious addictive cycle that sends a user scrambling for the next fix as soon as he or she comes down. The crash creates intense depression, anxiety, and physical tremors. Crack addictions are exceedingly dangerous and often result in fatal overdoses. If you or someone you know is addicted to crack cocaine, it’s vital that you enroll in a drug rehabilitation center immediately. Crack addiction only gets worse with time. If you need help, get it quickly. Due to the intense withdrawal symptoms, the cycle of crack addiction can be difficult to break. Relapse rates are high and it can sometimes take multiple rounds of rehabilitation to break the addiction completely. The longer a person has used, the harder it can be to quit. Those suffering from a crack addiction need medical attention and a residential rehab program to be able to detox and recover. The longer a person has used, the harder it can be to quit. While there is no medication available to treat or break a crack addiction, Clonidine, a blood pressure medication, is sometimes prescribed during crack recovery treatment to curb the cravings during detox. The difficult detox process is supervised by medical professionals in a rehab facility. Most residential programs include individual, family, and group counseling that teach coping strategies for managing cravings and developing a lifestyle that doesn’t involve crack cocaine or similar substances. Recovery is a group effort. Recovery programs are often tailored to suit the individual on a case-by-case basis. Getting treatment for an addiction is an important first step in a longer commitment to your health and life balance. Understanding the emotional and environmental factors that contributed to the formation of the addiction will be the key to unraveling it from your life. Check yourself into a professional drug rehabilitation center to detox and take care of your health. Examine your lifestyle and relationships to fully understand how a drug addiction came into your life. Make new choices to avoid relapsing into a person and place you don’t want to be anymore. Asking for help with a drug addiction can be embarrassing and difficult for some people due to the shame and social stigma that comes with admitting the problem. However, even if you can’t confide in friends or family members, it’s important to seek medical help and counseling from a clinic or recovery center before the adverse medical side effects of a drug addiction take a toll on you far worse than humiliation. Help is there, you just have to ask. Achieving a successful recovery from an addiction to Crack Cocaine is an impressive and admirable feat. If you or someone close to you has just come out of recovery, congratulations are in order. Weathering the detox can be painful and the cravings will be persistent for weeks or months afterward. Periodic check-ups with a doctor or drug recovery counselor may be necessary but staying connected to a support group is essential. Recovery is about making new choices. The most difficult part of addiction recovery isn’t the body beating you get during the detoxification process. It’s the active role you have to play in your life going forward, making the choices that will take you down a different path and toward goals that matter to you. People sometimes turn to addiction to cope with difficulties in their lives. But the drug just becomes another difficulty, a way to run away. Recovery is about learning your own self-worth and deciding to do something different, something better. In order to fully recover from a debilitating drug addiction and move into a happier, fuller, more productive and healthy life, you may need to make some changes in certain areas of your life. It’s important to remember that avoiding relapse will always be a factor in your life but you are in control of you choices. Structure your life in a way that supports your own health and wellbeing to ensure long term addiction recovery success.